First, in a plant ecology course of approximately 60 students, the professor required that we read primary literature; however, the method of discussion, as I recall, consisted of the professor guiding us through the figures in lecture format. The main point I remember him stressing was p-values. I don’t recall gaining much about the scientific process or how to effectively read a scientific paper. Second, in an advanced molecular genetics course composed of approximately 12 students. In this course, we were assigned three questions about the paper. To my recollection, even the most talented individuals in the class often had difficulty answering these questions correctly. Discussion of these papers consisted of the professor asking students about their answers to these questions and perhaps some discussion of the figures. Because basic understanding of the article was inadequate the participation, not surprisingly, was poor and the approach seemed ineffective. Though I may sound critical of these approaches, I commend these professors for integrating primary scientific articles into their courses. In general there seems to be a pervading hesitation to introduce primary literature to undergraduates because it may be “too hard” or they “aren’t ready.” Confronting primary scientific literature for the first time as an undergraduate is intimidating. For precisely this reason, undergraduates need a more directed approach to learning how to read scientific literature. In fact, because I found these attempts unsatisfactory, as I developed as a scientist I was mindful of what hindered my understanding of scientific literature as an undergraduate. My hope as a teacher in higher education is to bridge that gap for the undergraduates enrolled in classes I teach. As a graduate student in the early weeks of graduate school, overwhelmed with the volume of papers my fellow students and I were required to read each week, I became solid in my conviction that learning to read primary literature as an undergraduate is an essential skill that must be addressed. The capacity of my peers and myself to comprehend primary literature, and to increase the efficiency with which we did so, increased rapidly over the first year of graduate school, in large part due to the sheer number of papers we were required to read. However, I remained convinced that an essential skill required for functioning in the scientific community had been essentially ignored in my prior education. From that point, I was determined to find an effective way to integrate primary literature into the undergraduate classroom. Nearly a decade since I was an undergraduate daydreaming as my ecology professor lectured on p-values, I was finally able to make an attempt at introducing primary scientific literature to undergraduates in a way that seems to have met with success. Students should receive greater direction when being introduced to primary literature. Articles should be subdivided into sections to acknowledge an article’s complexity for the students. Discussion of primary literature should be more active, allowing students to identify points of misunderstanding and employ peer interaction to address this misunderstanding. First, what I felt was lacking in my own undergraduate introduction to primary literature was guided instruction in specifically how to read a peer-reviewed scientific article. I believe, at that stage, the student has to be more specifically guided through the most important components of the paper. That the student will be able to obtain deep comprehension of an article and answer broad questions on the article is, in my opinion, a faulty assumption. Second, I believe that the amount of data found in primary literature can alone be daunting for an undergraduate. Therefore, assigning segments of a paper so that each student is only accountable for part of the whole makes for a more manageable portion of careful reading. And last, the students must be more engaged in analyzing the paper. In my own experience, lack of understanding coupled with a lecture on the paper that fails to hold the student accountable leads to students becoming quickly disengaged with the material. 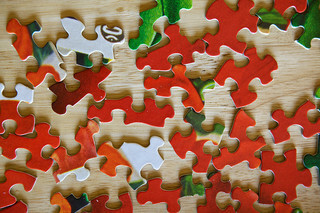 The “jigsaw” is a pedagogical technique in which individuals are typically assigned different articles from a small set of readings, then grouped with peers for discussion, and then re-grouped or shuffled in some way for further discussion. At each stage, students share information, integrate ideas, and draw on sharing of resources to understand a complex concept addressed by the set of readings. This technique had been occasionally employed in the Preparing Future Faculty course in which I was recently enrolled, and the jigsaw seemed particularly applicable to discussing primary literature. Using this approach, I could effectively reduce the complexity of each article by assigning students only parts, and increase interaction by making students responsible for discussing their portion. I have implemented this approach in an advanced cell and molecular biology course with nine enrolled students, which I am currently instructing at a local liberal arts college. On the first day of class I randomly assigned each student to a “home group” – these groups of three would be a working group throughout the semester. In these “home groups” students would be discussing the pa per. Within each home group, each student is assigned a figure (or sometimes two figures) from the primary article. One article is assigned to the entire class. Students are given a handout consisting of four sections: the first section contains general questions that all students are responsible for answering; the next three sections are the individual assignments, groups of questions that address each figure. The general questions typically pertain to the introduction section of the paper and highlight background information that will help the student understand the context of the paper. The questions focusing on figures encourage the student to appreciate how scientists ask questions and develop experiments to test those questions. Typically, the first and last questions in these sections are, respectively, “What question are the authors addressing with this figure?” and, “What conclusions do the authors draw from these data? Do you agree that the data support these conclusions?” This handout helps guide students through the relevant information and prevents them from getting too distracted by less pertinent information. Also, my aim is to encourage them to consider not only the factual content of the paper, but also introduce them to how they authors construct the study: by asking specific questions and devising experiments to test these questions. Frequency of assigning readings was the first issue I needed to address in organizing the course. “Is one reading a week too much? Yeah, that’s probably too much. Is one reading every two weeks too little?” Ultimately, I decided to divide discussion of literature into two-week sections, with Fridays allocated as discussion days. On the final Friday of the two weeks, students discuss a peer-reviewed article using the jigsaw technique. I have found that this timeframe provides a clear structure to the course, allowing students to anticipate the workflow of the class throughout the semester while not being too heavy of a reading load. Paper should expand upon topics recently covered in lecture. The paper should not be difficult. I find it is better to select articles that have clear questions that are addressed with straightforward experiments. If possible, the paper should have a clear link to an interesting biological or pathological problem. Providing a clear “why” for a study provides greater context for the student. The first paper we covered investigated DNA damage in a breast cancer model; another investigated the role of lipid rafts in Huntington’s disease. Once the article has been selected, and an appropriate guide has been created for the article, the time has come to put the jigsaw into action and refine student thinking about the paper. What follows is the general flow of the jigsaw discussion days: for approximately the first 20 minutes of class the students meet with other individuals who were assigned the same figure as them. This allows students to discuss the figure, reach a consensus regarding the main points of the figure, and become more confident in returning to their home groups to discuss their portion of the paper. The students are allowed some time in their home groups to discuss each section of the paper before I distribute additional questions that focus on the paper as a whole. This may include questions comparing two figures or questions that challenge the students to make judgments about certain figures in the paper, for example, “What do you feel is the most important figure of the paper?” My intent is that these questions guide them to consider how the different parts of the paper fit together in a narrative that addresses a larger question, as well as the role each figure plays in a paper. During this time, I move from group to group, addressing any questions they may have and taking that opportunity to link the material to what we have been covering in lecture. The first Friday in the two-week module provides some flexibility. This day can be used to address background that will make the primary article due the following week more approachable, as well as to describe any techniques used in the paper that have not yet been covered. I have also come to use this day as a time to introduce other sources beyond the textbook into the class for discussion. For example, the news focus sections of Science and Nature can provide a source of readings that are lighter than primary articles, but that still engage students with current scientific activity. I try to use this introductory Friday as an opportunity to link lecture content to current applications of great interest. This combined with the primary article discussion makes the relevance of lecture material to their future scientific careers more clear. The Approach – Is It Effective? Students can communicate scientific findings with their peers. Students can interpret scientific data. Students can develop a scientific hypothesis and devise a set of experiments to test that hypothesis. Students will increase their ability to comprehend scientific literature. provides an opportunity to connect application with previously-covered course content. In my own undergraduate experience, some professors recognized the benefit of exposing undergraduates to primary literature, but didn’t quite meet the students “where they were at” in terms of being able to comprehend such an article. Keeping in mind what I thought was lacking in my own experience, I have tried to develop a guided approach that engages the students more deeply with peer-reviewed literature. My goal is that this will better-prepare students for the challenges they will face in graduate school, as future scientists and professionals, and as future citizens who will need to understand the scientific process in order to make important decisions in our increasingly technological society. On Leading Discussion of Primary Literature in Science Classes – a model for all courses that include discussion of primary academic literature, from articles to chapters to conference papers. Puzzle photos by Chiot’s Run (first and third) and lumaxart (middle) used under CreativeCommons Attributions / Non-Commercial License. Great advice. I’ll be trying this approach in my upcoming courses in Spring. Thanks. This is really fantastic! I like the mechanistic, piece-wise, systematic approach. It reminds me of the “close reading” methodology employed for analysis of fiction in English classes.